Format: bilingual DVD, 100 min. Comments: Fun, but not all it could have been. Once again, a Final Fantasy product has been released that doesn't bear too much of a resemblance to the games I grew up loving. There's a neat little story here, good music, and good animation, but somehow, I feel that there's more style than substance. Lately, I've felt that the entire series has lost its soul somewhat. Final Fantasy VI (on the SNES) remains my favorite of the series, and despite its less-impressive graphics than the more recent PSX versions, it had characters I actually cared about. I wasn't so enamored with the 7th through 10th games of the series. Hopefully, this show will take a turn for the better, however. Oh, and for the record, this series is not set in the fantastical world “popularized in the Final Fantasy games," as the back of the box proclaims. Any gamer worth his or her salt knows that no Final Fantasy game (except for 10, now) has ever been set in the same world. Yes, there are conventions connecting the games, but it's never on the same planet. There's always a Cid, there are always Chocobos, and the world is usually on the brink of destruction, but this is not a sequel nor is it a prequel to any existing game, so don't get your hopes up to that extent. When a dimensional gate appears on Earth, the alternate world known as Wonderland is suddenly connected to our blue planet. After a dozen years pass by, two scientists make a routine journey into the other realm, assuring their twin children of a swift return. But they don't come back. With courage in their hearts and chocolate in their backpacks, Ai and Yu decide to depart for Wonderland, seeking out their lost parents. On the Phantom Train that carries passengers from one world to the next, they meet Lisa, an attractive young woman who is heading to Wonderland for her own mysterious reasons. She sympathizes with the children and resolves to accompany them until they are reunited with their mother and father. However, it will take more than the combined might of two young kids and a woman to handle what they're about to encounter - even if Lisa has some hidden special offensive abilities. 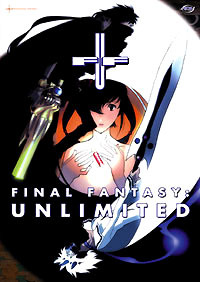 Final Fantasy Unlimited boasts an undeniably different look than most other anime. CG is mixed with more traditional animation styles, and while it may stand out, it works within the world of the series. Character designs for many of the villians are very bizarre, though this is a good thing, considering most of the characters live in an alternate reality called Wonderland. The artists for the show grant the series an excellent otherworldly feel with a flood of imaginative details. There are only four episodes on the first disc, but the extras make up for it. There's a voice actor (and ADR director) commentary for the first episode with the two English female leads of the series. There's also a slew of production sketches and preliminary illustrations from the earlier stages of the show's development. The first volume is available alone or with a collector's box, which comes with a free T-Shirt offer. Unlike other ADV releases that have bundled a shirt with the disc, this time, ADV has gone the extra mile by allowing customers to choose the shirt size. The only downside to this is we have to have the shirt mailed to us, but still, it's nice being able to choose a shirt that will actually fit.